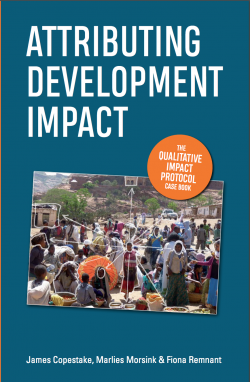 We’re delighted to announce, after many months of work, that ‘Attributing Development Impact: The Qualitative Impact Protocol Casebook’ will be published in Spring 2019. A pre-publication flyer with more information can be downloaded here. Thanks to the very generous support of the University of Bath Alumni Fund, we have secured Open Access rights, so the book will be available as a pdf online, as well as available to purchase in hard copy.